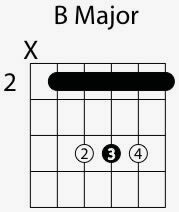 Here is the shape for the a B major guitar chord. This shape is very common but it is also very useful. This chord diagram uses one of the more common bar chord voicings. The lowest root note of this chord is the B on the 2nd fret of the 5th string. If you need help reading chord diagrams you can go directly to the how to read guitar chord diagrams guitar lesson.